Mac DeMarco, the casual king of good times, walked onto the Danforth stage drenched in a rather ominous deep red light and into an absolute wall of screams. Though this DeMarco show was decidedly calmer and sweeter than previous Toronto appearances. DeMarco is one of those who relentlessly tour, and I'm sure night after night of antics would drain even the most excitable and rambunctious musicians. That, mixed in with the fact that his latest release, This Old Dog, focuses less on his goofy ways and more on his similarity to songwriters such as Randy Newman or Harry Nilsson. Also, friendly reminder: people change and artists grow. That said, DeMarco opened his set with the jingle-jangle of "Salad Days," and one could've sworn that every person in the crowd was singing along. "We're gonna do a classy one," Demarco said, before heading into "My Old Man" as bassist Jon Lent— –who looked decidedly uncomfortable throughout the set and had to be reminded by Mac to turn around and face the audience — took a swig from a bottle of red wine. DeMarco flicked a lighter and without a moment's pause, the audience was speckled with little flames held high — the man truly had a hold on the crowd. "What day is it, Friday? You know what that means…" DeMarco began saying, as an audience member tossed him a pack of darts. Without missing a beat, DeMarco caught the pack and delved into "Viceroy," which again proved how beloved he was to the crowd. However, there was a clear divide between new and old DeMarco songs — the audience seemed far more keen on his older, bouncier tunes ("Freaking Out The Neighbourhood" really hit the spot) than cuts from This Old Dog. Demarco and his band dealt with this by adding little moments that they knew would please — perfectly cheesy chimes as a song began, DeMarco motioning to the beat. There were some lyrical goofs, some vocal strains, and both Mac's mic and the bass seemed a tad too low at times. The synths on "Chamber of Reflection" sounded far better than the last time DeMarco came to town, but there were still some tech issues as he fiddled with cables during the song. After wishing an audience member "Happy Birthday," Demarco and his band shut it down with a far more upbeat version of "Together," whom he sweetly dedicated to his lady, Keira. DeMarco crouched atop his amp with a bottle of Jameson as they took a break during the tune, allowing guitarist Andy White to have a go at an interlude. Then, the moment I'm sure everyone was waiting for — DeMarco leapt into the crowd and surfed his way to the back to give his sound guy a smooch on the mouth. 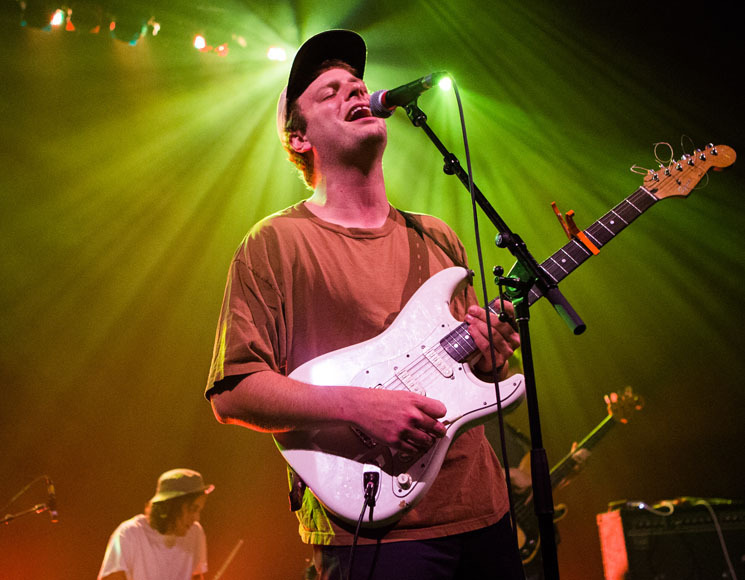 When he returned to the stage, his Paul McCartney shirt ripped and missing a shoe, it was clear that Mac Demarco is a beloved figure. As far as one could tell they were happy, watching their Mac-y. Order This Old Dog on limited-edition silver vinyl here.